Great Work Mine was once one of the largest tin mines in Cornwall, employing over 3000 people in the late 16th century. This area is Leeds Shaft, which is one part of Great Work. Great Work Mine was a major tin producer. The extent of the workings occupy the area between Godolphin Hill and Tregonning Hill. The engine house here is to work Leeds shaft and was restored in 2005. At one point this site was hideaously unsafe, now we can take a close look in relative safety, but remember, no mine workings are completely safe! Mining here is recorded to have been taking place from at least 1540 and interestingly, blasting was first introduced to this mine in 1689 by Thomas Epsley. Leeds Shaft was the main shaft for the mine, named after the Duke of Leeds into whose ownership the mine transferred from the Godolphin family in 1785. Great Work eventually ceased working in the mid 20th century. 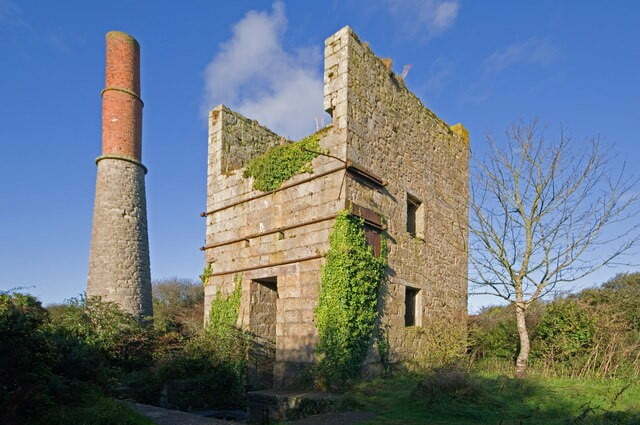 Both the chimney and the engine house are grade II listed – see HERE and HERE . Both date from around 1829, with the engine house being built to house a 60-inch cylinder steam-pumping engine made by Harvey’s of Hayle. Great Work Mine is part of the World Heritage Mining site.